Burlington police reviewed the incident in this video, which was captured by a witness. Story updated 2:52 p.m. on 11/3/14 to include the police version of the event. Burlington police gave a detailed account of a struggle that led to two arrests and accusations of police brutality after a video of it was posted online Sunday, saying a man assaulted officers. 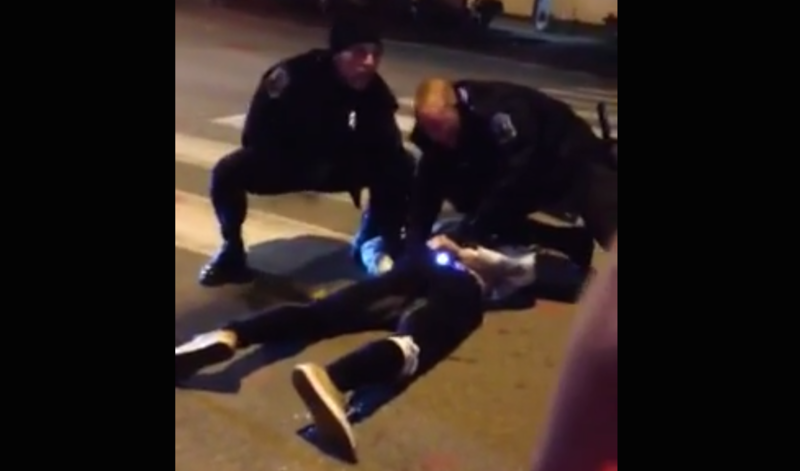 In 38 seconds of video footage captured by a witness near the intersection of Main Street and South Winooski Avenue early Sunday, two officers are confronted by bystanders as they grapple with a man lying face-down. One of the officers strikes the man on the ground, who appears to have his hands underneath him. Some bystanders yell at the cops, with one saying, "You can't do that!" Around 2 a.m. Sunday, officers Ryan Rabideau and Ethan Czyzewski responded to a report of a man climbing a telephone pole. On the way there, they saw Shane Langevin, 20, of Winooski, hit another man on the head, causing him to fall to the ground, police said. As they tried to take Langevin into custody, he refused to put his hands behind his back. A struggle ensued. After officers brought him to the ground, he tried to stand up, and “delivered a blow with his elbow to the right eye of [Rabideau]” according to the police statement. “Langevin also struck [Czyzewski] in the jaw during the struggle,” police said. Langevin briefly broke free, police said, before he was hit with a Taser shot, which caused him to fall to the ground. (The statement did not say which officer fired the Taser.) While lying on the ground, Langevin continued to struggle, and officers were unable to get his hands from under his body, leading to what police called the "distractionary strikes." Meanwhile, a crowd gathered and began yelling at the officers. Staff from nearby bars and restaurants helped officers keep the crowd back, police said. Michael Mazza, 34, of St. Albans approached the officers “with clenched fists,” police said, as the officers struggled with Langevin. One of the officers pepper-sprayed Mazza, which stopped him. Langevin and Mazza were not together, police said. Czyzewski was treated and released from Fletcher Allen Health Care for bruises to his face, police said. Langevin, who has convictions for disorderly conduct, assault, and domestic assault, was on probation for violating an abuse prevention order and other charges, police said. He was held on $5,000 bail on two charges of assault on a law enforcement officer, resisting arrest, disorderly conduct and simple assault. Mazza was charged with impeding a police officer, police said.